Anyone can create a product that solves a problem OR makes people feel good about themselves. 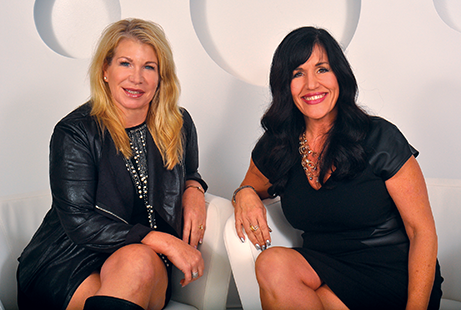 Sisters-in-law, Lisa Harrington and Kimberly Martinez, were inspired to create a product line that does both. Their mission began 15 years ago. Lisa worked as a pediatric nurse and was required to wear an employee ID badge. Her 8 year-old daughter Katie created a beaded necklace for her mom to wear so she could “remember her” while she was at work. Lisa clipped her ID to the beaded necklace and a new product category was born! Her co-workers at Cincinnati Children’s Hospital loved the concept and were clamoring for one of their own. Lisa and Katie created a cottage business making and selling these beaded ID necklaces that allowed for creative expression and personality at work, replacing the boring “shoe lace” style lanyards and badge reels provided by the hospital security department. Lisa shared the overwhelming response to her ID necklaces with her sister-in-law Kimberly, at a family Christmas dinner. Kimberly, a former Fortune 50 executive and mother of 3 who had been downsized as a result of the events of 9/11, saw a huge business opportunity in Lisa’s story. Fueled by adrenaline and outline a rough business plan on the back of a Christmas card envelope. The following morning she convinced Lisa that they needed to free working women around the world from the fashion disaster that comes from wearing an employee ID badge and Bonitas International was born! This synergy of invention, timing and courage allowed them to create not only a thriving business, but an entire new category in the fashion accessory world. The fact is that women own 50% of the businesses in the United States, yet less than 3% ever achieve sales over $1 million. Bonitas International smashed through that milestone in their 3rd year of business. A certified Women-Owned Business, Bonitas has been listed on the Inc. 5000’s list of fastest-growing, privately-held businesses the last four years. Today the company is the market leader in the niche category of Identification Jewelry. Their product collections have expanded to include retractable badge reel jewelry, fashion ribbon lanyards and on trend beaded and chain lanyards, as well as coordinating jewelry. Boojee ID jewelry makes the perfect gift for yourself or any working woman who wants to identify with style!